Meteor Crater is a meteorite impact crater located about 35 miles (55 km) east of Flagstaff, near Winslow in the northern Arizona desert of the United States. 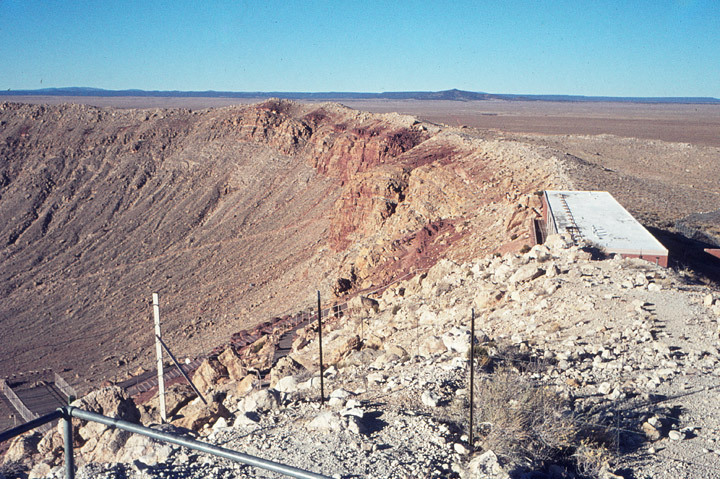 The site was formerly known as the Canyon Diablo Crater, and scientists generally refer to it as Barringer Crater in honor of Daniel Barringer who was first to suggest that it was produced by meteorite impact. 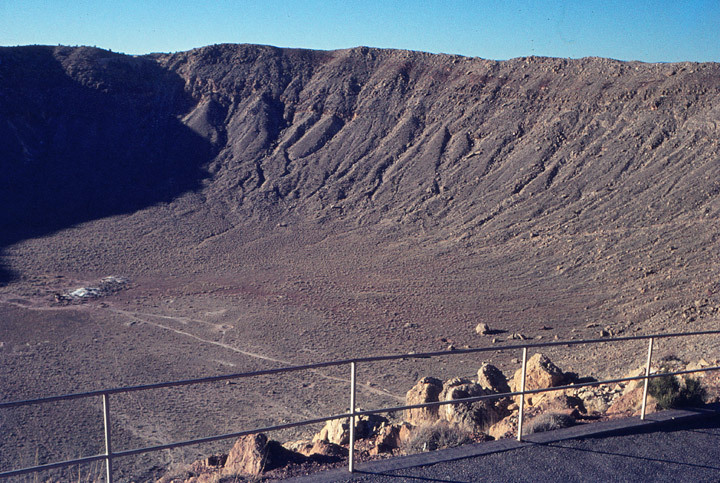 Meteor Crater lies at an elevation of about 1740 m (5709 ft) above sea level. It is about 1,200 m (4,000 ft) in diameter, some 170 m deep (570 ft), and is surrounded by a rim that rises 45 m (150 ft) above the surrounding plains. The center of the crater is filled with 210-240 m (700-800 ft) of rubble lying above crater bedrock. The crater was created about 50,000 years ago during the Pleistocene epoch when the local climate on the Colorado Plateau was much cooler and damper. At the time, the area was an open grassland dotted with woodlands inhabited by woolly mammoths, giant ground sloths, and camels; it was probably not inhabited by humans. 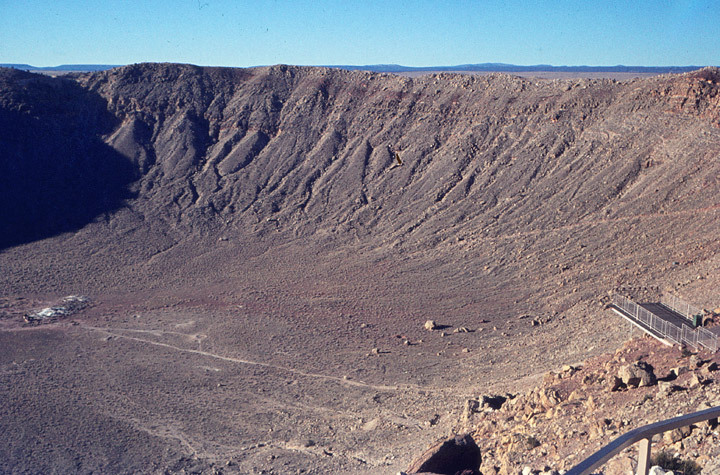 The object that excavated the crater was a nickel-iron meteorite about 50 meters (54 yards) across, which impacted the plain at a speed of several kilometers per second. The speed of the impact has been a subject of some debate. Modeling initially suggested that the meteorite struck at a speed of up to 20 kilometers per second (45,000 mph), but more recent research suggests the impact was substantially slower, at 12.8 kilometers per second (28,600 mph). It is believed that about half of the impactor's 300,000 tonne (330,000 short tons) bulk was vaporized during its descent, before it hit the ground. The impact produced a massive explosion equivalent to at least 2.5 megatons of TNT – equivalent to a large thermonuclear explosion and about 150 times the yield of the atomic bombs used at Hiroshima and Nagasaki. The explosion dug out 175 million tons of rock. The shock of impact propagated as a hemispherical shock wave that blasted the rock down and outward from the point of impact, forming the crater. Much more impact energy, equivalent to an estimated 6.5 megatons, was released into the atmosphere and generated a devastating above-ground shockwave. For a meteorite of its size, the impact melted surprisingly little rock, though it produced high enough temperatures and pressures to transform carbon minerals into diamonds and lonsdaleite, a form of diamond found near the crater in fragments of Arizona's Canyon Diablo meteorite. Limestone blocks as massive as 30 tons were tossed outside the crater's rim, and debris from the impact has been found over an area of 100 square miles (260 km²). The shock of the impact would have produced a localized earthquake of magnitude 5.5 or higher. The blast and thermal energy released by the impact would certainly have been lethal to living creatures within a wide area. All life within a radius of three to four kilometers would have been killed immediately. The impact produced a fireball hot enough to cause severe flash burns at a range of up to 10 km (7 miles). A shock wave moving out at 2,000 km/h (1,200 mph) leveled everything within a radius of 14-22 km (8.5-13.5 miles), dissipating to hurricane-force winds that persisted to a radius of 40 km (25 miles).espite this destruction, the Barringer impact did not throw up enough dust to seriously affect the Earth's climate. The area was likely recolonized by the local flora and fauna within a century. This did not much affect the crater itself; its preservation was aided by the local climate's shift to its present-day arid conditions. The meteorite itself was mostly vaporized. Relatively large chunks of nickel-iron fragments, ranging from gravel size to blocks weighing up to 640 kg (1,400 lb), have been recovered from the debris field surrounding the crater. Several thousand tons of tiny nickel-iron droplets, the size of sand grains, fell in and around the crater after condensing from the cloud of metallic vapor produced by the impact. Very little of the meteorite remained within the pit that it had excavated.